The major players in the market include Sparton Corporation (U.S.) and Ultra Electronics (U.K.). Acquisitions, long-term supply contracts, and new product launches are some of the major strategies that are adopted by the market players in the global sonobuoy market. The market size estimations for the various segments and sub segments of this market were arrived at through extensive secondary research, corroboration with primaries, and further market triangulation with the help of statistical techniques using econometric tools. The ecosystem of the sonobuoy market comprises raw material suppliers, manufacturers, distributors, and end users. The key end users of the sonobuoy market are naval forces and environmental research organizations. The sonobuoy market is characterized by direct distribution channels and the presence of mainly OEMs and Tier 1 & Tier 2 companies. Some of the key players of the market include Ultra Electronics (U.K.) and Sparton Corporation (U.K.). This report would help the sonobuoy manufacturers, suppliers, retailers, wholesalers, distributers, and sub-component manufacturers to identify hot revenue pockets in this market. Furthermore, this study answers several questions for the stakeholders; primarily which segments to focus over the next five years for prioritizing efforts and investments. 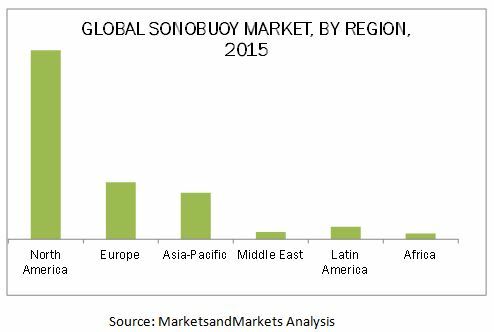 The sonobuoy market is estimated to be valued at USD 226.11 Million in 2015 and is projected to reach USD 316.59 Million by 2020, at a CAGR of 6.96% during the forecast period from 2015 to 2020. Factors, such as the increasing focus by countries on strengthening their Anti-Submarine Warfare (ASW) capabilities, increase in the efficiency of sonobuoys due to various technological advancements, and rise in maritime disputes in Asia-Pacific, are expected to drive the growth of the sonobuoy market. The key applications considered for the market study are defense and civil, wherein the overall sonobuoy market is dominated by the defense segment. This segment is projected to grow at a comparatively higher CAGR during the forecast period of 2015 to 2020, primarily driven by the high demand for sonobuoys which form an integral part of anti-submarine warfare (ASW) which is a key area of importance due to the increasing maritime disputes and the development of stealthier submarines. The segment comprising passive sonobuoys dominates the sonobuoy market, segmented based on function. This segment dominates the studied market, and is expected to continue its dominance over the next 5 years, primarily driven by the high demand for passive sonobuoys which are more effective in detection due to their ability to prevent the detection of a tracking aircraft by a submarine. The APAC region is expected to exhibit the highest growth rate in the sonobuoy market, and is projected to grow at a CAGR of ~8% during the forecast period from 2015 to 2020. The growth of the sonobuoy market in this region can be attributed to the rise in maritime disputes and increased government spending by countries, such as China to strengthen their anti-submarine warfare capabilities. Some of the factors such as limited capability of sonobuoys to detect increasingly stealthier submarines in littoral zones may limit the growth of this market. The major players in the market include Sparton Corporation (U.S.) and Ultra Electronics (U.K.). Acquisitions, long term supply contracts, and new product launches are some of the major strategies adopted by the key players in the sonobuoy market. For instance, Sparton Corporation’s growth strategy has involved acquiring complementary businesses as well as entering into joint ventures and acquisitions. Moreover, Ultra Electronics has also entered into inorganic strategies partnerships and acquisitions in order to cater to various niche markets. These strategies have helped these companies maintain their leadership position in the market. 16.6 Lone Star Electronics Co.
16.8 Sigma-Pi Power Sources Pvt Ltd.